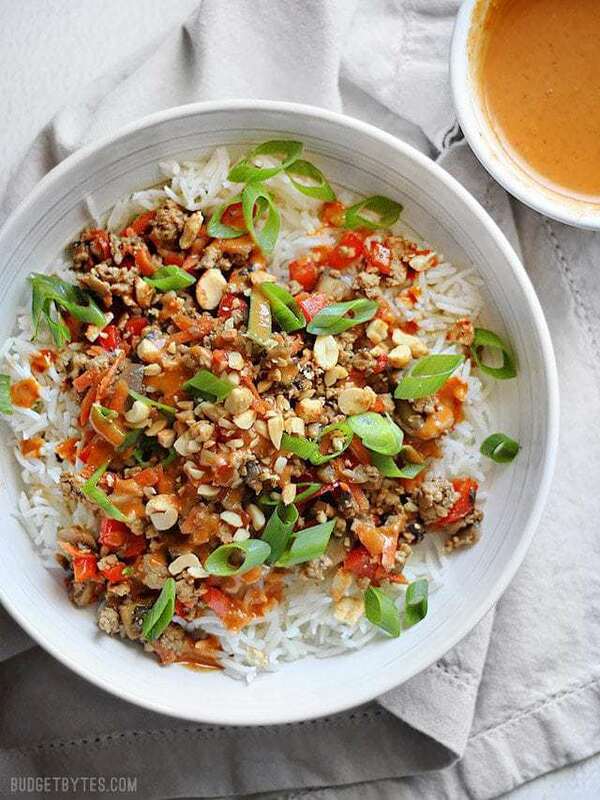 This recipe started out as a craving for lettuce wraps and ended up as Hoisin Stir Fry Bowls with Spicy Peanut Sauce because IMHO it’s just a whole lot easier to eat things out of bowls instead of lettuce leaves, or is that just me? Plus, the nice soft-but-sturdy lettuce that are perfect for lettuce wraps happens to be a little on the expensive side and this is Budget Bytes, not No-Budget Bytes. So, since I’m all about bowl meals, I made a lettuce wrap filling and just spooned it over rice. But hey, you could totally do this in lettuce leaves if that’s your jam. As usual, I went halfsies with the meat and vegetables to reduce costs and sneak more vegetables into the meal. 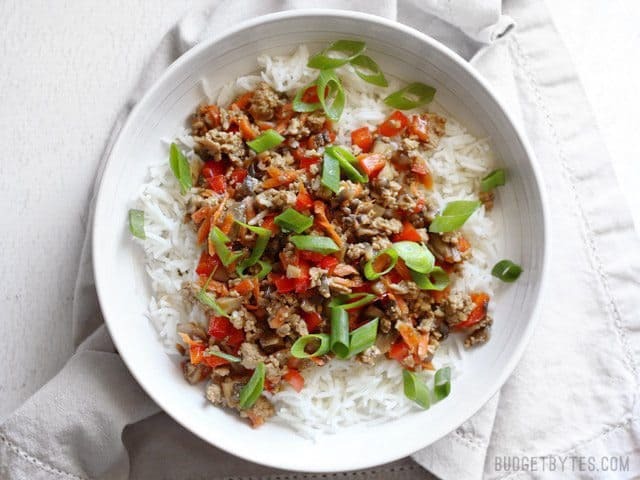 I used ground pork because there wasn’t much of a ground meat selection at the store today, but you could absolutely swap it for ground chicken or turkey. 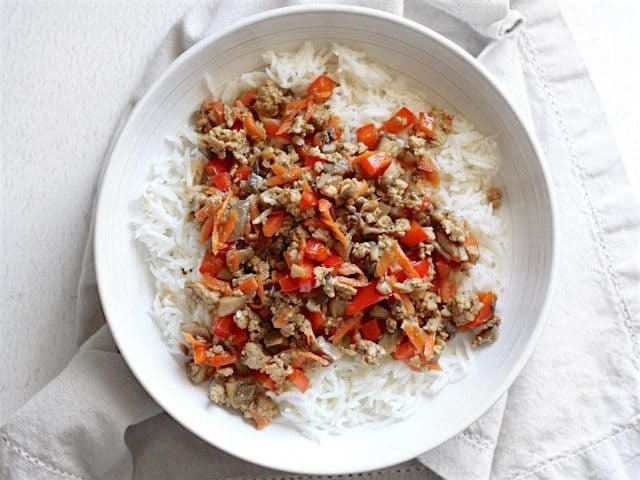 I used finely chopped mushrooms to mimic the texture of the ground meat, then added shredded carrots and diced red bell pepper for color and crunch. The mixture was then coated in a healthy dose of hoisin sauce (a sweet and tangy sauce often described as an Asian BBQ sauce), with a little extra soy sauce and toasted sesame oil for depth. The meal comes together quickly, has a lot of color and texture, and is totally filling. Mmm-mm, I’m lovin’ it! 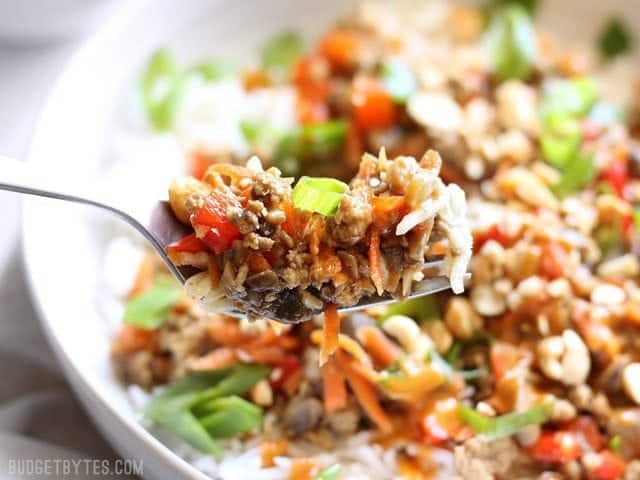 Hoisin Stir Fry Bowls with a rich and spicy peanut sauce are a fast answer to dinner with tons of color, texture, and flavor. Use pork, chicken, or turkey! 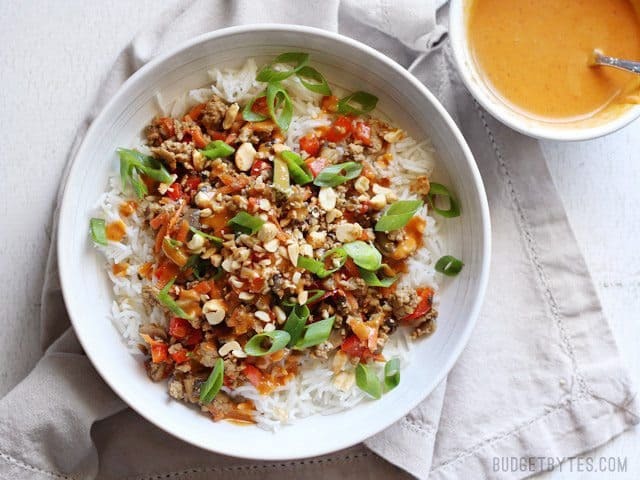 Mix the spicy peanut sauce first to allow the flavors time to blend. 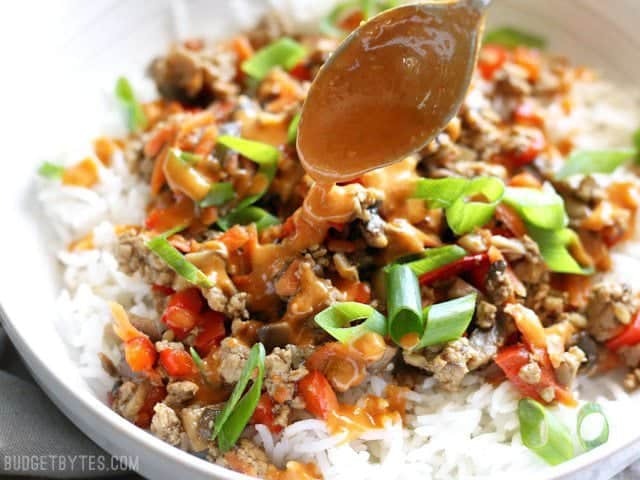 In a small bowl, combine the peanut butter, sriracha, soy sauce, brown sugar, and grated fresh ginger (use a small holed-cheese grater to grate about 1 tsp). Stir in one tablespoon of hot water at a time until the sauce is thin enough to drizzle. Set the sauce aside. Mince the garlic and grate another teaspoon of fresh ginger. Heat the cooking oil in a large skillet over medium flame. Add the garlic and ginger to the hot skillet and sauté for about one minute, or just until the garlic is softened. Add the pork and continue to sauté until the pork is cooked through and crumbled (about five minutes). While the pork is cooking, rinse the mushrooms then chop them into small pieces. 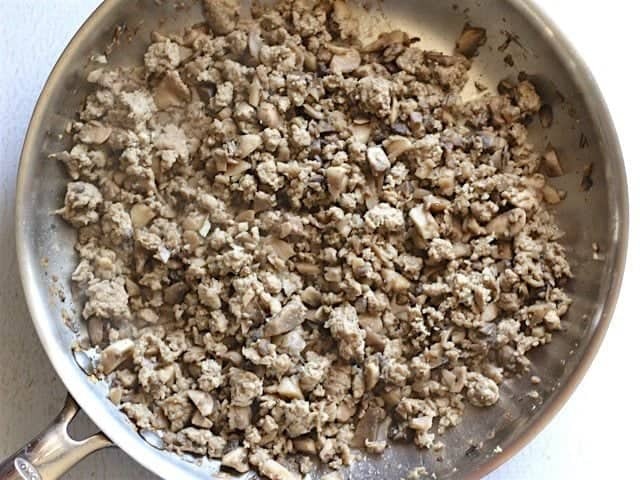 Once the pork is cooked through, add the chopped mushrooms and continue to sauté until the mushrooms have wilted and released all their moisture (about five minutes). 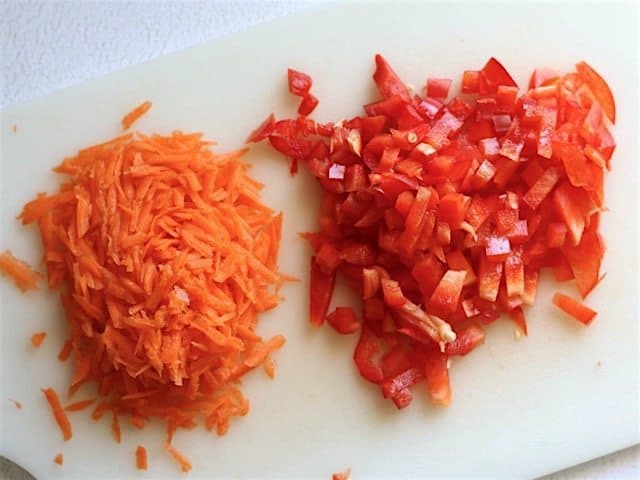 While the mushrooms are cooking, peel the carrot then shred it using a large-holed cheese grater. Finely dice the red bell pepper. 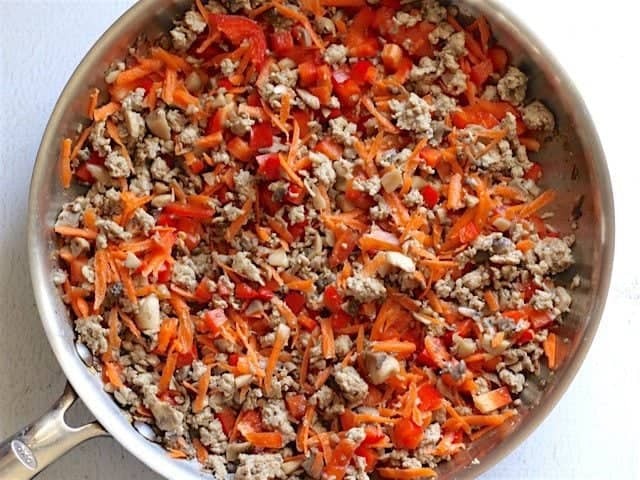 Once the mushrooms have cooked down, add the shredded carrot, diced bell pepper, hoisin sauce, toasted sesame oil, and soy sauce to the skillet. Stir and cook until everything is coated in sauce and heated through. (The amount of soy sauce needed may vary depending on the brand of hoisin sauce used. Start with 1/2 Tbsp and add more to taste). 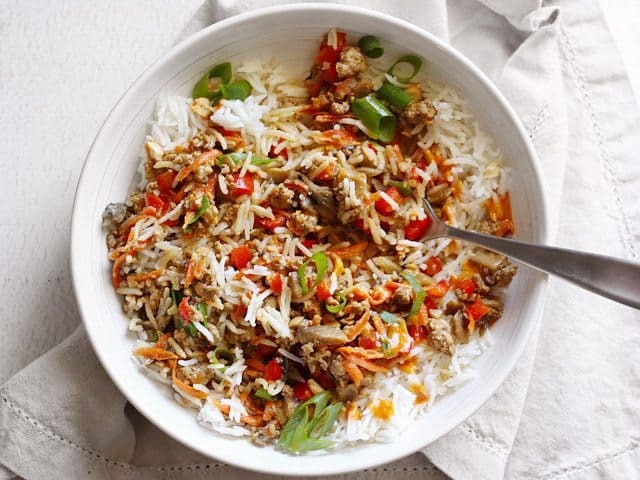 To build the bowls, start with one cup cooked rice, then add 3/4-1 cup of the meat and vegetable mixture. 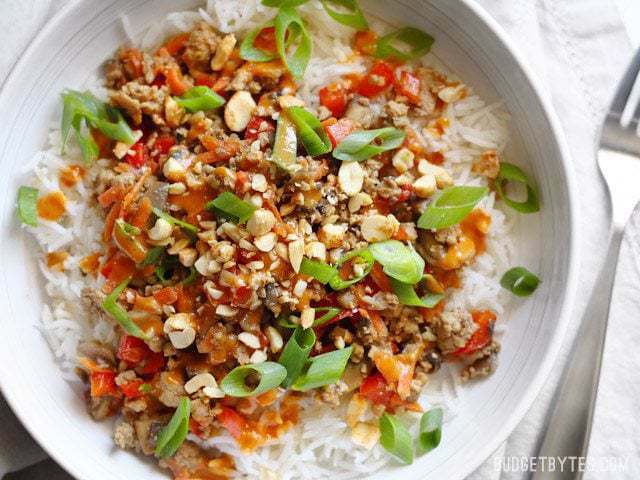 Sprinkle a few sliced green onions on top, then drizzle 1-2 Tbsp of the spicy peanut sauce over everything. Finish with about 1 Tbsp of the chopped peanuts. *Short on time? This bowl will still be great with just the crushed peanuts and a drizzle of sriracha. **neutral cooking oils are mild in flavor, like canola, peanut, or grapeseed. Start with the spicy peanut sauce so that the ginger time to infuse into the sauce. 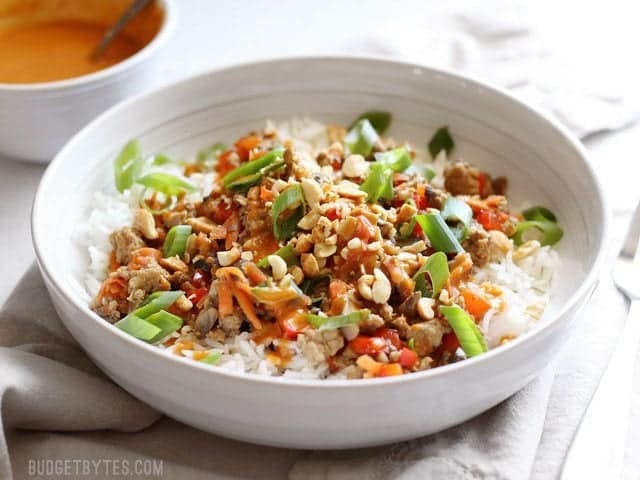 In a small bowl stir together 1/4 cup natural style peanut butter, 1 Tbsp sriracha, 1 tsp soy sauce, 1 tsp brown sugar, and about 1 tsp freshly grated ginger (use a small-holed cheese grater). Then add one tablespoon of hot water at a time until it’s thin enough to drizzle. I used 3 Tbsp water total. Set the sauce aside. Mince two cloves of garlic and grate another tsp of fresh ginger. Add 1/2 Tbsp of any neutral cooking oil to a large skillet and heat over a medium flame. Add the garlic and ginger, sauté for about a minute, then add 1/2 lb. 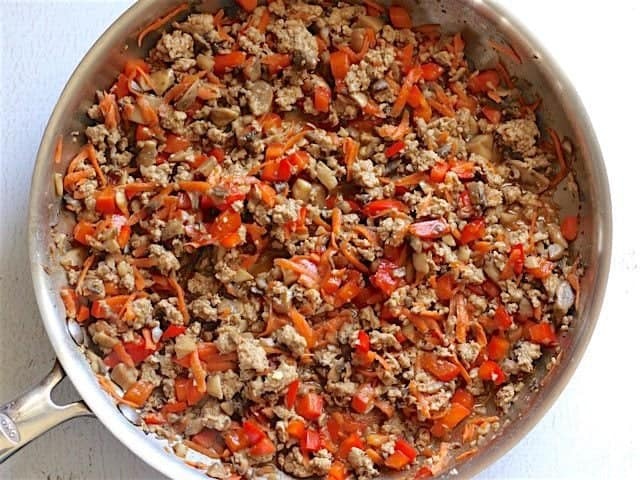 ground pork, chicken, or turkey. Cook the meat until it’s fully browned and crumbled (about 5 minutes). While the meat is cooking, rinse 8oz. of button mushrooms and chop them into tiny pieces. 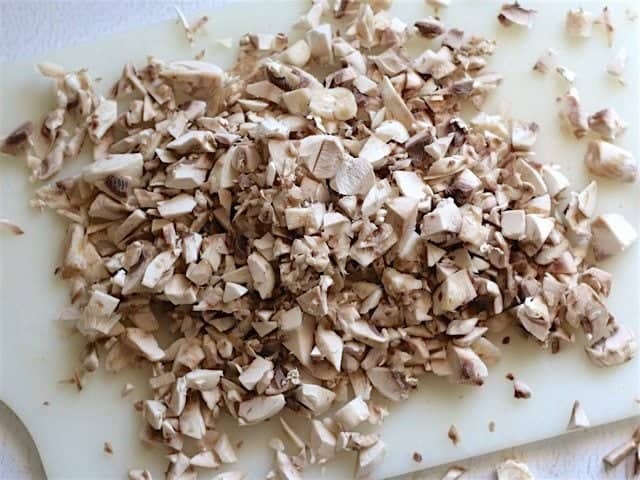 No need to pay attention to the size or shape of the pieces, just chop away until they’re small and only slightly bigger than the meat crumbles. The goal is to make them blend in seamlessly with the meat and they will shrink a bit when cooked. Once the meat is cooked through, add the chopped mushrooms and continue to sauté until the mushrooms have wilted and let out all their water (about another 5 minutes). See, they blend right in with the meat! While the mushrooms are cooking, peel and shred one large carrot using a large-holed cheese grater (or in my case, two small carrots). Cut the bell pepper into a very small dice. Again, you want the pieces to be a similar size to the meat and mushrooms. What sauce, you say? Hoisin sauce! 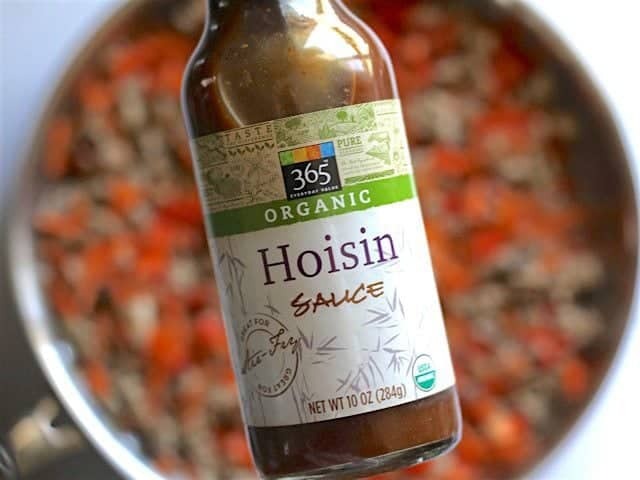 Hoisin is a great all-purpose sweet and tangy sauce that can be used on its own or as a base of more complex sauces. For this dish, I added 1/3 cup hoisin, plus 1 Tbsp soy sauce and 1 tsp toasted sesame oil. The amount of soy sauce that you add will depend on the saltiness of your hoisin, so start with a little less and add more if needed. To build my Hoisin Stir Fry Bowls, start with 1 cup cooked rice, then add 3/4 to 1 cup of the meat and vegetable mixture. Add a small handful of sliced green onion. You could also use cilantro here, or BOTH. 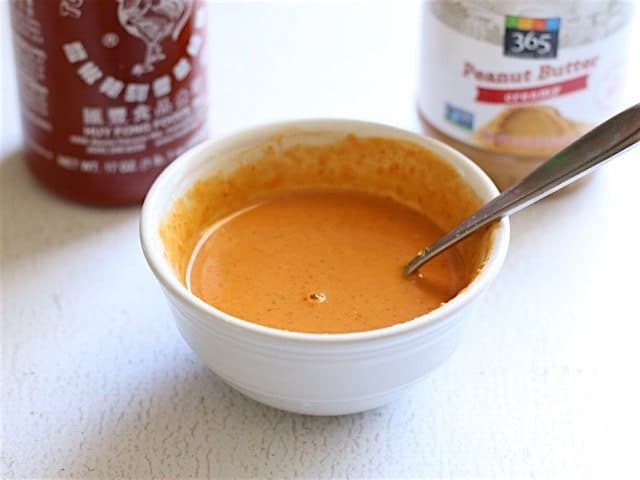 Then drizzle on some of that amazingly rich and spicy peanut sauce… You have about 1/2 cup of the sauce so you can use up to 2 Tbsp per bowl. Finally, add a tablespoon or so of chopped peanuts. I love the chopped peanuts here because they add a final layer of super crunchy texture that takes the bowl over the top! And there you have it–Hoisin Stir Fry Bowls with Spicy Peanut Sauce for about $2.50 per serving. It’s a little pricier than most of my meals, but considering the fact that I used super high end pork and a few organic ingredients, it’s really not bad! I love this recipe and I subbed the pork with tofu and it turned out amazing. Such an easy, filling and tasty recipe. Wow. Just wow. Made exactly as written and even the husband called this the best new recipe he’s eaten. Yum! Made this tonight, with extra baby corn and broccoli. The kids had theirs without the peanut sauce and the adults devoured the whole batch of sauce with no trouble! Definitely making this again. And that peanut sauce is a ridiculously easy satay cheat! We made this tonight and it was fantastic!!! We did sub the mushrooms for frozen okra, other wise exactly the same and it was delicious! This was dinner tonight. So good! 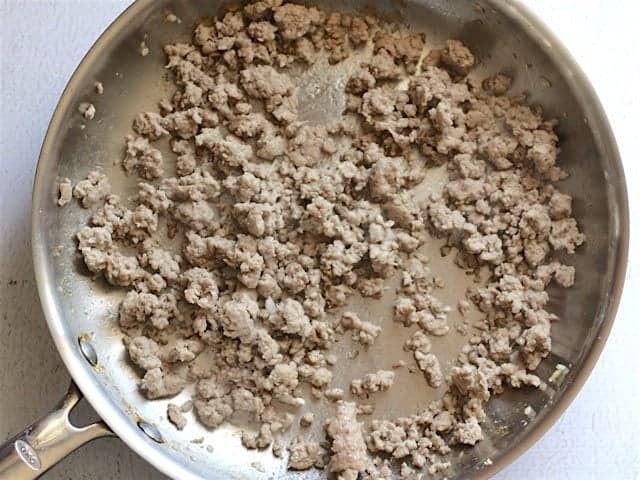 I used ground turkey (85/15). Easy to prepare except for dicing that blasted red pepper :-). I will make this again!